On one side of Paris Square where the Jerusalem vigil took place stands a Franciscan-owned building called “Terra Sancta College”. Ensconced upon the roof, the Virgin Mary and Child look down upon the endless traffic snarls and political squalls that take place below, maintaining for eternity their same serene gaze. I find that comforting. In addition to the church college within, Terra Sancta then housed the British Council library, Magnes Press, and part of Hebrew University – institutions for the dissemination of holiness and/or culture. Some might even say – now that two millennia of church-inspired violence is almost behind us – institutions for the civilization of humanity. On Terra Sancta’s outer wall, one short block from the vigil, someone posted a large sign through several years of the intifada. This sign carried a tally of the ongoing political violence. When I made a note about this sign in my journal on April 1, 1993, the sign read: “168 killed since the beginning of the intifada”. Next to the tally was a huge board with the names of all those who perished. Well, not all who perished. To tell you the truth, the number 168 accounted at the time for only 14% of those who perished. Those who didn’t make it onto the memorial list were the Palestinian victims of the intifada. In fact, at the date that the names of 168 Jews were memorialized there, an additional 1,165 Palestinians had also been killed. The sign-makers apparently believed that Palestinians were somehow not worthy of getting onto their memorial sign. The sign was deliberately placed near the Women in Black vigil by a right wing Jewish group in an effort to refute our message. “End the occupation?” was their implied question, “Look who’s killing who.” More likely, placing the sign near us had the effect of making Women in Black more determined than ever to continue to stand. Disagreeing vehemently with someone always seems to have that effect, doesn’t it? There was always something to make Women in Black want to hunker down and run that damn vigil forever. For the first 3 years of the vigil, the number of women who participated was constantly increasing. By the end of the first year, 80 women were showing up every week in Jerusalem, and vigils had begun in Haifa and then in Tel Aviv. At our first year anniversary commemoration (in December 1988), we were 500 strong. In the second year, our regular weekly attendance in Jerusalem was a solid 100 women every week, and the number of vigils around the country gradually increased to 23, having spread to various kibbutzim and urban centers in the north and south. At our second anniversary commemoration (December 1989), 600 women from all over Israel showed up to Jerusalem to stand at the vigil. The third year saw a steady 120 women every Friday in the Jerusalem vigil, and an incredible 39 vigils throughout the country. We were probably 2,000 at our third anniversary commemoration (December 1990 – see below). Estimates were that 4,000-5,000 women considered themselves part of the Women in Black movement throughout Israel, some of these regular vigilers and others willing to turn out for special occasions. As for spectators, we have no hard data other than the fact that at least 20,000 people saw the vigil in Tel-Aviv on any given Friday, but this was the most highly exposed vigil. The Jerusalem Post, a right leaning newspaper at the time that consistently under-played peace efforts, estimated that a total of 20,000 people saw all our vigils, but that was clearly a gross underestimate. By the middle of the second year of Women in Black, when vigils existed in 23 separate locations around Israel, it became clear that the time had come for all of us to meet. This would be an opportunity for women to appreciate the size and breadth of the movement, to discuss issues of common concern, and to draw together in solidarity. A national conference of Women in Black – the first of what would become an annual event – was held on September 9, 1989 at Kibbutz Harel. About 300 women attended the day-long event that included political consciousness-raising and testimonies from women who were active in the territories. Some workshop subjects: self-defense, cooperation between Arab and Jewish women on the vigils, how to take advantage of the media, relations with the police, and various scenarios to achieve peace. I remember the conference as both inspiring – realizing that there were so many of us – and shocking – coming face to face with some radical perspectives. In particular, I recall the pathos-filled words of Jewish lawyer Leah Tsemel as she described her meetings with the families of Palestinians who had lost sons in the intifada. “They are regarded as martyrs,” said Leah, describing the views of the Palestinians. To me and many others, it sounded as if they had lost touch with reality, but in fact this was a reality that the media never reported. The Harel conference brought us face to face with the diversity among us, and it ended with a mass vigil on the highway, in which we realized that we can stand together despite our differences. 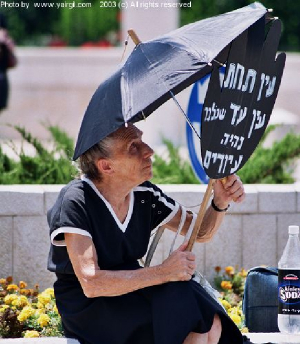 Standing at a Women in Black vigil was only one expression of the vibrant women’s peace movement in Israel. Other women’s peace groups were also in their heyday during these years, and sometimes Women in Black vigils organized their own non-vigil activities. In the cities, women could choose among a variety of organizations, but in the villages and kibbutzim, Women in Black was often the only framework for organizing, and consequently did more than vigiling. In addition to the conventional protest activities, there were new, women-oriented strategies: dialogue groups with Palestinian women, visits to and support for Palestinian women prisoners, sewing a giant tablecloth for the peace negotiating table, distributing toys and books to Palestinian children, distributing clothes and food to needy refugees, entering the territories to witness first-hand the effects of occupation, showing film clips of the effects of the occupation (some of which had been censored from Israeli media), and much more. The menu of activities was rich and varied, and could easily swallow up a woman’s total day, week, month, and year. An organizational coordinating body had to be established and was – the Women and Peace Coalition. Now if only someone would coordinate our lives! 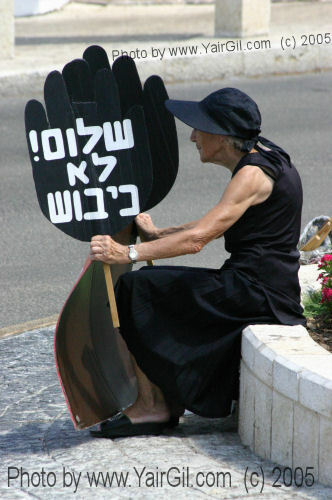 Most women’s peace activists (except for the more establishment Reshet women) also regularly attended the Women in Black vigil nearest their homes. This was the activity that bound most of us together. And the vigils, not surprisingly, also became a forum for organizing and for making announcements about peace and human rights events of other organizations, women’s and mixed. It was a ripe recruiting ground for the warm bodies required for demonstrations, marches, sit-ins, rallies, nonviolent actions, or just plain lectures. Activists walked around the vigil plaza distributing flyers and invitations on little slips of paper. Invariably women would end the vigil with a fistful of scraps announcing other events, in addition to any Women in Black meetings that were planned. The Jerusalem vigil, which was the largest, became a weekly happening. There was a constant presence of foreign media filming, photographing, interviewing women. What they saw, in addition to a wide circle of women standing on a 3-foot wall dressed in black and carrying black hands that said “End the Occupation”, was an orbit of satellites moving around us at ground level: supportive men serving water or dried fruit; hawkers of left wing books, magazines, and pamphlets; sellers of political buttons, greeting cards, or t-shirts (profits donated to the Jahalin Bedouin, the Palestinian women’s center, a library for Gaza, or the like); Michal selling subscriptions to Challenge; Maxine or Ruth or Shosh circulating petitions to protest the demolition of Palestinian houses (or deportations or incarceration without trial); Ezra handing a beautiful red rose to each of us; and children climbing up and down the wall and all over us. Sometimes it was hard to juggle all the props of this street theater production: an “End the Occupation” sign, Ezra’s rose, political manifestos, scraps of invitations to events, and a new “End press censorship!” t-shirt that would make a great gift for one’s nephew. Tourists asked us to pose for pictures with them, and signed a guest book that Dafna Kaminer circulated. CNN was a regular caller and Dutch, German, Italian, Swiss, and god-knows-where-else television crews filled entire documentaries about us. (The Israeli media never went that far.) And through all this, we were dodging missiles propelled from passing vehicles or mere verbal projectiles. It was exhilarating to be part of that energy. The first three years were the heyday of Women in Black in Israel. Vigils sprouted throughout the country and the women who participated were heterogeneous, having a wide range of political views. These were the early years of the intifada, when violence in the territories raged and public opinion raged about what to do about it, from the iron-fist policies of the late Yitzhak Rabin to the rapprochement efforts of those on the left. During the intifada years, Peace Now made its appearance only when some traumatic event hit the headlines. It was the big splash theory of peace organizing, and most of the peace camp felt that showing up for these occasional rallies was sufficient. Women in Black, however, felt the need to be more visible, to be a continual in-your-face presence countering right wing views. “A body that demonstrates every week, not just occasionally, is like a thorn in the minds of people,” said Avital Shapira of Kibbutz HaZore’a. “It irritates your conscience and doesn’t let go, as long as the occupation continues.” Some Women in Black would show up only for special occasions, but many felt the need to come every week. Our need to come. I clearly remember feeling that it would be hard not to show up to the vigil. Women in Black also became a channel for developing contacts and sometimes friendships between Jewish and Palestinian women. Many of the vigils, especially those in the northern Galilee area of Israel where there is a large Arab population, were mixed, Jewish and Arab, and standing together on the vigil fostered fierce loyalties to each other. In addition, many vigils organized activities with Palestinian women in the territories. By the time of the annual Women in Black conference in mid-1990, it was only natural to hold it at Kufir Yassif, a beautiful Arab village in the Galilee. In fact, in addition to the 400 Jewish and Arab Israelis in attendance, there were also 20 Palestinian women from the West Bank town of Jenin, under Israeli occupation. At Kufir Yassif, the Jewish women were warmly welcomed into the homes of the local Palestinian women, and the speeches and discussion groups were interspersed with dancing together on the village green. “Fear as a Barrier to Peace” was the theme of the conference, but the suspicion and distrust between Jewish and Palestinian women melted away for us as we talked, danced, ate, and lived together. Through Women in Black, many of us who came from temperate backgrounds felt ourselves getting sucked into the vortex of what was then considered more radical views. Some of this shift to the left was in response to the outrageous messages of the right (“168 killed since the beginning of the intifada”). Some of it was in response to the more radical views of women we trusted and respected on the vigil, and the fact that Peace Now had already taken more progressive positions. Some was a reaction to the spiraling violence in the territories and our growing familiarity with individual Palestinians, meaning empathy for their predicament. And some of it may very well have been a reaction to being treated aggressively by outsiders, especially the authorities. A case in point was the women’s peace conference held on Friday, December 29, 1989. This conference was convened one day before the powerful “Hands Around Jerusalem” demonstration, in which demonstrators from Jewish peace organizations joined hands with Palestinians and members of the European peace movement – a human chain of 30,000 men and women encircling the Old City of Jerusalem to express their desire to live amicably side by side. Peace Now, one of the co-sponsors (together with Palestinian and European groups), did a yeoman’s job of organizing this complex event and involving participants from all the Israeli peace organizations. It ended, however, in an onslaught of police brutality – billy clubs, water cannons, tear gas, and rifles – over-reacting to the fact that some Palestinian demonstrators had (horrors!) begun to shout slogans and brandish a Palestinian flag. Many were injured, including Marissa Mano, a schoolteacher from Naples, who lost an eye when police directed water hoses against the crowd, shattering a window beside her. There was extraordinary media coverage of the event and the concluding violence, a full investigation ensued that vindicated Peace Now’s claims that the police had over-reacted, and disciplinary measures were taken against various police officers. On the previous day, however, another impressive demonstration had taken place that ended in the same brutal way, but without the coverage or investigation into police behavior. This event was organized jointly by Israeli, Palestinian, and Italian women’s organizations, with prominent peace activists from Europe and North America also attending. The very coming together was already a cause for excitement, as it was the first mass rally for peace organized jointly by Palestinians and Israelis in which both sides were equal partners in the planning. The speakers at the morning’s conference also represented the gamut of the women’s peace movement: well-known feminists, leaders of the Israeli, Palestinian, and Italian women’s labor movements, professors, and international peace leaders. Despite the moderate views of many of the speakers, they all demanded that the Israeli government negotiate with the PLO and allow for an independent Palestinian state side-by-side with Israel, ending with a joint statement to this effect. These views were held by fewer than 10% of the Israeli population at large during this period, but here they were sounded within the moving context of hundreds of Israeli and Palestinian women hailing the cause of peace. Many of us remember the feelings of energy and elation from the speakers at this conference. “Today I feel the power amassing here of thousands of women”, declared Naomi Chazan. Rachel Ostrowitz, an editor of the feminist journal Noga, regards this conference as a turning point for women – “a demonstration of presence unprecedented in scope and power.” And Knesset Member Yael Dayan, who has experienced one or two acrimonious debates in her life, added enthusiastically, “Political dialogue between women is always better...purer, more genuine, more substantive. Women really listen to each other, and only then respond, without exterior motives, looking for the greatest common denominator.” The excitement generated in that packed hall – an estimated 1,500 women – was palpable, and then the women filed out and headed to the Women in Black vigil. The vigil was record-breaking, uncountable by our usual method of sending around a head-counter, but we estimated 2,000. (This day also marked the third anniversary of Women in Black.) In addition to the usual “End the Occupation” hands, there was a sea of new signs: “Women Against the Occupation”, “End All Oppression”, “2 States for 2 Peoples”, “Talk to the PLO”, and the slogan of the day, “Women Go for Peace”. But the vigil was secondary compared with what then commenced – a dramatic march through Jerusalem. Over 2,000 women dressed in black from all over Israel, Jewish and Palestinian, filled the street for the march. We walked from Paris Square through West (Jewish) Jerusalem, feeling the immense power of our numbers and the excitement of the event. Although not many Jerusalemites saw this march – it was not at prime time and not routed through a busy part of town (a combination of our inexperience and police cautiousness led us to agree to such low profile arrangements) – nevertheless most of us felt elated by the number of women who turned out, and to hell with anybody who didn’t see us. Many of us also remember the Security Services photographers at the side of the road taking our pictures – stills and video – for their files. We walked with growing conviction through the streets and then entered East (Arab) Jerusalem, where we were met and joined by a huge procession of some 3,000 other women, mostly Palestinians with a small contingent of Italians too. Now we were 5,000 women strong marching through the streets of Jerusalem, most dressed in black. In Yvonne Deutsch’s words, “...even the skeptics among us were overwhelmed by the power of that experience”. You can imagine why the police were so agitated by our presence – 5,000 strong women in an unprecedented alliance of Israelis and Palestinians. It must have pushed all their buttons. They were obviously expecting trouble and they tried to intimidate us by using their horses to shove us from behind as we marched. But the police completely panicked when we reached the end of our march, at the al-Hakawati Theater, where several Palestinian women, deviating from the agreed upon plan, unfurled a flag of Palestine. All hell broke loose. The police started to swing their clubs and fists, and then they exploded the whole event with tear gas and hauled off seventeen women, including a member of the Italian parliament. Many women had caught fistfuls of knuckles and others were wounded by clubs and teargas. No inquiry was ever opened about the police behavior at our demonstration and the whole day received only scant attention in the local media, though the New York Times accorded it a picture and full story. This is the kind of experience that could only serve to raise the consciousness and strengthen the resolve of already strong-willed women. The acts of hostility to Women in Black or to Palestinian women with whom we had connections had the same effect – they hardened and politicized us, deepening our sense of community and our commitment to each other. The kibbutz women who witnessed the Israeli army wielding brute power in Jenin when a curfew was called also underwent a process of radicalization. Aggressive behavior, whether by the police, soldiers, or the right wing, against women on the vigil or our Palestinian friends had a powerful effect on those who had been more mild-mannered politically. Even the moderate Reshet, after having participated in this conference and march that had ended in police violence, held its own meetings with PLO leaders in blatant defiance of the law. Was this a loss of innocence? It was a combination of having seen things that undermined Israel’s claim to running an “enlightened occupation”, increased alienation from mainstream views in Israel, and feeling at home only inside the cocoon of the women’s peace movement. Loyalty to the vigil was much deeper than just a defiant reaction to hostility. Vigil participation was driven primarily by powerful ideological beliefs. Had attendance records been kept, many women would have had near-perfect scores. Our lives moved over to make room for the vigil, and for its spinoff activities. The vigil satisfied a need felt by many of us to do something – not a one-shot deal, but a continual recurring statement of our point of view. We wanted to say that not all Israelis support the violence, the militarism, the dehumanization of the occupation. I quote below four voices of Women in Black of the many I could have presented. I have not changed in any of this. It is Zionism that today preaches chauvinist, fanatic, and militarist nationalism and which is willing to sacrifice everything to the bigots. I cannot accept this. My entire family was killed in Auschwitz: I am revolted by the notion that we are causing suffering to others that I myself experienced. As a daughter of exile, I am prepared to struggle on behalf of my principles, even at the price of being oppressed rather than the oppressor. That is why I stand at Women in Black. Dr. Veronica Wolf Cohen, a music educator and researcher, is an Orthodox Jew. Veronica was born in Budapest during World War II, survived the war in the ghetto, and escaped with her family to the United States after the 1956 revolution, from where she moved to Israel. In addition to her participation in Women in Black, Veronica has been one of the organizers of dialogue groups with Palestinians in the West Bank. At the start of the vigil, I stayed away because I feared that it would interfere with getting ready for the Sabbath....But how could I have forgotten what the Sabbath is really about?...Any act one performs for tikun ha-olam, the repair of the world, is an act of Sabbath preparation. Feverish activity in the kitchen is a misplaced emphasis. Now each Friday, as another cycle of six days of work comes to a close, I am grateful to my fellow Women in Black for giving me an opportunity for a last-minute act of tikun ha-olam as I prepare for the Sabbath. Our children should not have to live under occupation any longer. I want to encourage women to raise their voices for a better future for all of our children. In our daily life in the West Bank, we get to know Israelis as armed soldiers who wield arbitrary power at roadblocks and checkpoints; as the military authority issuing restrictions that make life hard; or as officers who make you wait hours for papers or permits which they can refuse just because they’re in a bad mood. Israelis fill up our lives as occupiers, and there is a big danger of becoming racist. I want to differentiate between Israeli politics and Israeli people. That’s easier for me if I get to know Israeli women who don’t wear uniforms or carry weapons. Opposite us on the road are extremist right wing groups holding slogans that demand “Death to Arabs” or call for our “transfer” outside of Israel, and the police pretend they do not see the slogans. If an Arab held similar slogans against Jews, he would end up in jail...Despite this, we have decided, together with men in democratic organizations, that we shall not give racism and hatred a chance to grow, nor add divisions to our two societies and two nations. Finally, dear daughter, your mother decided to continue her struggle in the street, the city, and the village. Your mother will continue to demonstrate in black to express the dual tragedy of both the Israeli and the Palestinian nations. When this tragedy comes to an end and there will be peace, I will put on my rosy garments and will have enough time to stand by your side, to look after and play with you, and take you in my arms to sleep in peace in my lap. God protect you and protect all the children of the world. Kisses from your mother. Most of us stood on the vigil because we could not stay home. Staying home meant endorsing the government policy of occupation of another nation. Staying home meant giving over the streets to the dehumanizers, to the signs that said “168 killed” with no mention of Palestinian casualties. Staying at home meant making peace with war, and that was unthinkable. By the time the intifada began to wind down upon the signing of the first Oslo accords on September 13, 1993, a total of 2,323 Palestinians and 155 Israelis had been killed as a result. While 5,000 women does not sound like much in large countries, in Israel that means that 0.2% of the total female population (women and girls) participated in the vigil. Randi Jo Land, “A Separate Peace?” Jerusalem Post, June 29, 1989. One example of their minimizing of peace work was in an article by Sue Fishkoff, “The Longest Hour of the Week”, Jerusalem Post, December 6, 1991, in which we were described as “a circle of women, maybe 20, maybe 50...” The reporter had actually given an accurate count of “70 women” in the story she submitted, but the editor chopped us down to the size he preferred. Personal communication from Sue Fishkoff, December 6, 1991. Goga Coogan, “Yom Shishi At Yoda’at”, Hotam, May 19, 1989 [Hebrew]. On the Israeli side was the Women and Peace Coalition; on the Palestinian, three women’s groups – the Federation of Palestinian Women’s Action Committees, the Union of Palestinian Working Women’s Committees, and the Women’s Committee for Social Work; and on the Italian side were the Italian Peace Association, the Woman’s House in Turin, and the Center for Documentation in Bologna. The panel, facilitated by Debbie Lerman of Tel-Aviv Women in Black, included (in order of appearance): Dalia Sachs, a Jewish Woman in Black from Haifa; Nabila Espanioly, a Palestinian Woman in Black from Nazareth; Caterina Ronko of the Women’s House in Turin; Zahira Kamal, chair of the Palestinian Women’s Committees; Masha Lubelski, Secretary-General of Na’amat (the women’s labor organization in Israel); Irena Klepfisz, poet, author, and activist from the U.S.; and Naomi Chazan, then a political science professor and activist, subsequently a member of Knesset. Other speakers that morning included: Alice Shalvi, founder and chair of the Israel Women’s Network, a feminist lobby; Hanan Bannura, a Palestinian nurse from Beit Sahur; Naila Iyash, who had spent five months in “administrative detention” and was wife of an expelled Palestinian; Rebecca Johnson, a former activist with Greenham Common Women; Sandra Rivers from the Women’s Democratic Delegation; and two more Palestinian peace and women’s rights activists from Israel – Mariam Mar’i from Acre and Nabeha Morkus from Kufir Yassif. Vered Levy, “A Feeling of Power”, Al-HaMishmar, January 1, 1990. Security Service photographers often attended the city vigils – and other peace actions – recording our faces for their files. Ilana Hammerman, a peace activist with the Year 21 organization, once testified as a character witness on behalf of a Palestinian in military court, and the prosecutor, seeking to undermine her testimony, revealed to the court a list of left wing demonstrations in which Ilana had participated! Personal communication from Ilana Hammerman, March 17, 1996. Yvonne Deutsch, “Israeli Women: From Protest to a Culture of Peace”, in Walking the Red Line, Deena Hurwitz (ed), Philadelphia, PA: New Society Publishers, 1992, pp. 46-55. “Officers Break up a March in Israel,” New York Times, December 30, 1989. Anna Colombo, “Even at the Price of Being Oppressed”, Women in Black National Newsletter, Winter 1992-93, No. 4. Veronika Wolf Cohen, “Preparing for Shabbat: The Vigil”, Women in Black National Newsletter, Fall 1992, No. 3. Marylene Schultz, “Standing Up for the Children”, Women in Black National Newsletter, Winter 1992-93, No. 4. Letter from Nabeha Morkus to her daughter, undated.